Pickford Film Center & Village Books present "Writers in the Limelight." Join us for the screening of lectures and presentations from some of the most celebrated voices in the humanities, arts, and sciences. Watch author David Eisenhower discuss his book, Going home to glory, in this special movie showing at the Pickford Limelight Cinema. (Author is not attending this event). We will have a Village Books hosted discussion after the showing. This engaging and fascinating memoir provides a uniquely intimate account of the final years of the former president and general. Dwight Eisenhower emerges as both a beloved and forbidding figure. With a grandson's love and devotion but with a historian's candor and insight, David Eisenhower has written a remarkable book about the final years of a great American whose stature continues to grow. David Eisenhower is the Director of the Institute for Public Service at the Annenberg School of Communication at the University of Pennsylvania. He is the author of Eisenhower at War: 1943-1945, which was a finalist for the Pulitzer Prize in history in 1987. 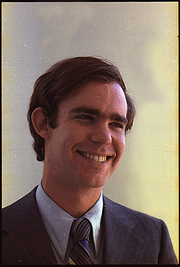 Educated at Philips Exeter Academy, Amherst College, and George Washington University Law School, he is the son of John and Barbara Eisenhower, and the grandson of President Dwight D. Eisenhower. He is married to the former Julie Nixon, younger daughter of President Richard Nixon. David and Julie Eisenhower are the parents of three adult children and live in suburban Philadelphia. This on-screen author talk will be showing at the Pickford Film Center's Limelight Cinema. Tickets are $5 and are available at Village Books and through the Pickford Film Center. Village Books will provide books for sale at the event. David Eisenhower is currently considered a "single author." If one or more works are by a distinct, homonymous authors, go ahead and split the author. David Eisenhower is composed of 2 names. You can examine and separate out names.